Inflammation is one strategy your body uses to fight infection, but if it gets out of control it can kill instead of heal. 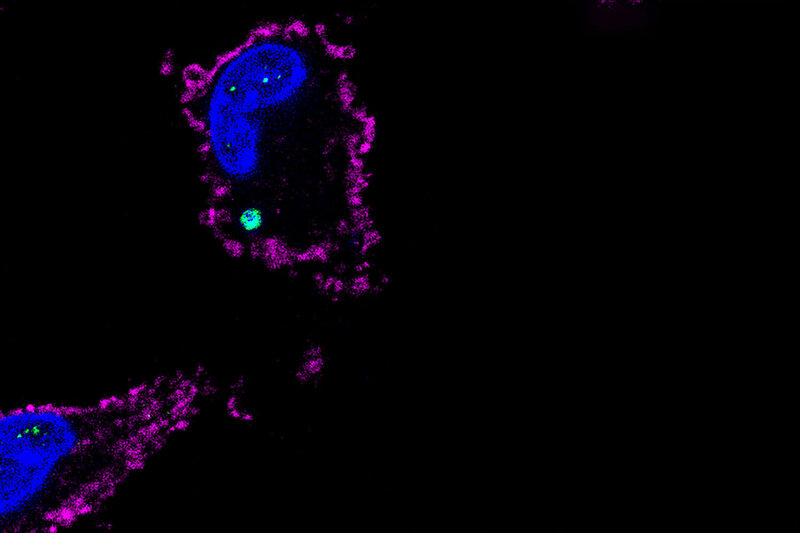 In the Sept. 18 issue of Immunity, UConn Health immunologist Vijay Rathinam and colleagues show how the body damps down inflammation, making clever double use of a protein previously thought to be responsible only for cell death. In a healthy cell there’s a place for everything, and everything in its place. DNA, the instruction manual for building proteins and doing just about everything else a cell does, is supposed to be contained within specific areas. So when a cell detects DNA somewhere it shouldn’t be, alarm bells go off. Something has invaded! Disorder can be deadly, so the cell sets off a defense system. Or rather, it sets off two defense systems simultaneously. The first leads to type I interferon. This is best for defending against viruses, and it tends to cause a lot of inflammation. The second is called the inflammasome pathway, and it sets off a different type of inflammation that leads to cell death. Both pathways can cause trouble if they run out of control. In particular, if there’s too much type I interferon, it can cause autoimmune disease and interfere with the body’s defense against bacteria. Rathinam and Ishita Banerjee, an immunology graduate student, were studying a mouse without the inflammasome in order to understand its role in bacterial infections. To their surprise, they found that when these mice were exposed to disease-causing bacteria, they had much higher than normal levels of type I interferons, which are made by the other defense system. Furthermore, these mice tended to die quickly from bacterial infections. This suggested that one arm of the defense system (the inflammasome) was helping the body defend against bacteria by damping the other arm (type I interferons). Intrigued, the researchers looked closer. It was already known that mice that couldn’t alert the inflammasome pathway couldn’t activate the end product, a protein called gasdermin D. Gasdermin D’s job, as far as anyone knew, was to poke holes in an infected cell’s wall and kill it. But Banerjee, Rathinam, and their colleagues realized that poking holes in a cell’s wall has other effects, too. The abundant potassium ions inside the cell quickly spill out of it, for example. And they found that if the potassium concentration inside the cell falls too low, the cell cannot activate the type I interferon pathway. “Gasdermin D damps interferon! The protein’s previously known function was to cause cell death, and we identified a new function for this protein. The implication is that it also helps us control bacterial infection,” says Rathinam. Now the researchers are looking more closely at gasdermin D. They want to understand how the protein and loss of potassium in the cell shuts down the interferon pathway at the molecular level. They also want to look at gasdermin D’s role in autoimmune diseases such as lupus, when the body attacks itself with inflammation. There are clues that both DNA sensing and type I interferons are involved, and they wonder if this newly discovered way of controlling interferon is working – or not – in autoimmune diseases.